What is Bite Size English? An online learning programme for second language user adults of all ages to improve their everyday English. It can be accessed in own time and learning is at own pace according to own goals set. Online access is possible on PC, tablet or Smartphone, as long as the internet can be connected. 01. What does it do? 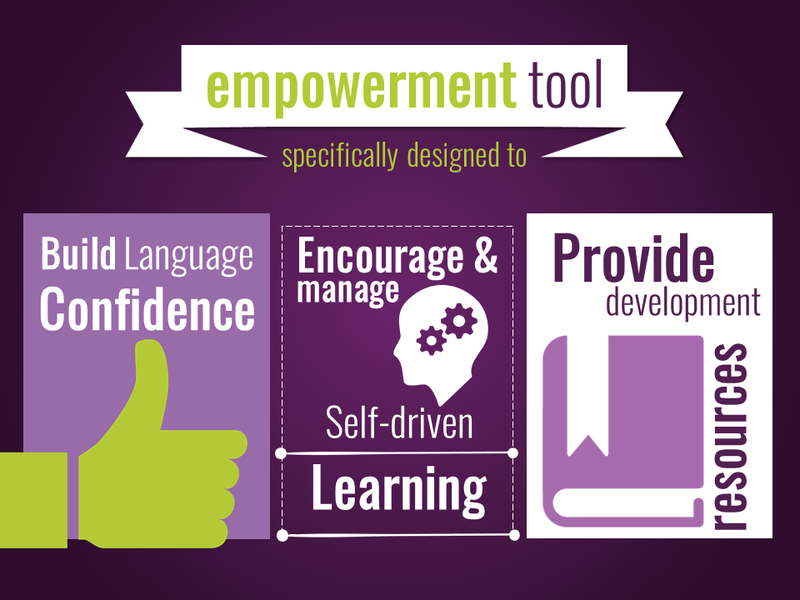 ​The programme follows an integrated approach to the four basic skills; listening, speaking, reading and writing. Honing each of the skills should always be in the context of integration and application. Immersion in the language is key. ​02. How does it work? We take a blended learning approach utilising an online learning management system with a designated remote coach to every learner. The coach monitors and guides progress by e-mail and messaging system. ​Social proficient users. With their foundational skills intact, Bite-size English will develop their skills to that of Minimum professional and General work proficiency. 04. Why would you enroll in Bite-size English? Every lesson follows a theme typical of work and life situations. Activities cover info on workplace jargon and job situations, how to sensibly manage personal finances, cope with love issues or death in the family, and societal challenges such as people living with disabilities. The main focus is communicative competence, integrating the four basic skills (listen, speak, read and write). Competencies are based on national and international outcomes and performance descriptors. Lessons challenge learners to critically interact with topics and issues of the day. 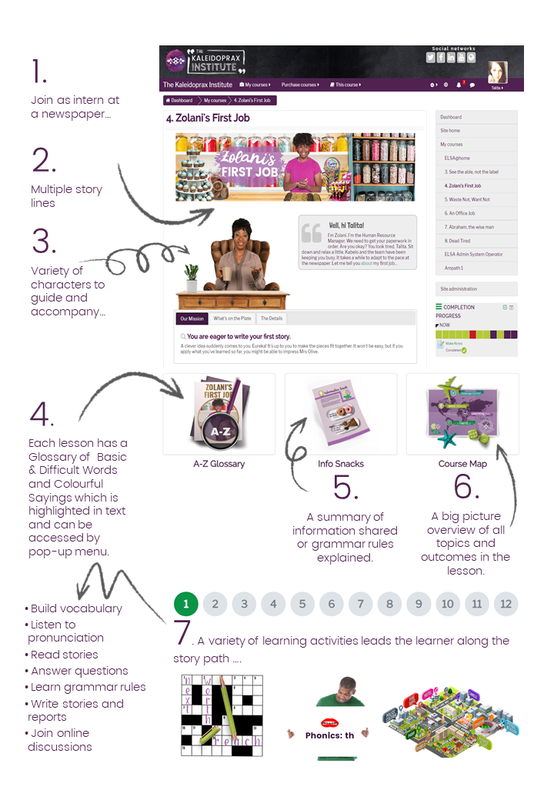 Activities build skills to collect, analyse, organise and critically evaluate information. 01. What do you need? 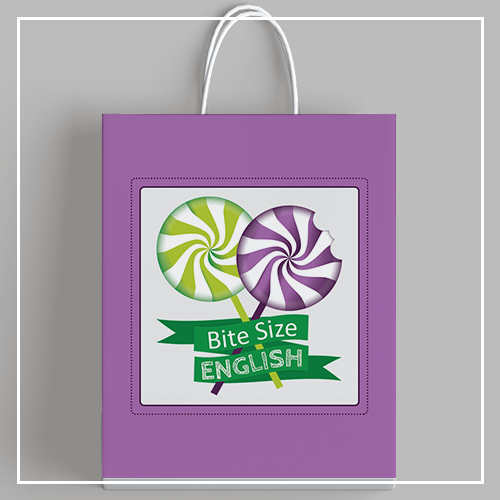 ​Bite-size English needs internet connection. It is accessible on computer, tablet & smart phone, but the ideal will be access using a keyboard to optimise development of writing skills. 02. How long does it take? ​Language is best improved by regular interaction, almost like eating – it is not advised to only eat one huge meal once a week, but rather eat regular meals daily! Language learning requires at least 120 hours of learning per proficiency level. A beginner would need at least 600 hours to reach a decent level of minimum professional skill. With Bite-size English, we aim to take the Minimum social proficient learner to a Functional literacy level to enable the skills to engage in a professional and working environment (Grade 9/NQF 1 and beyond). 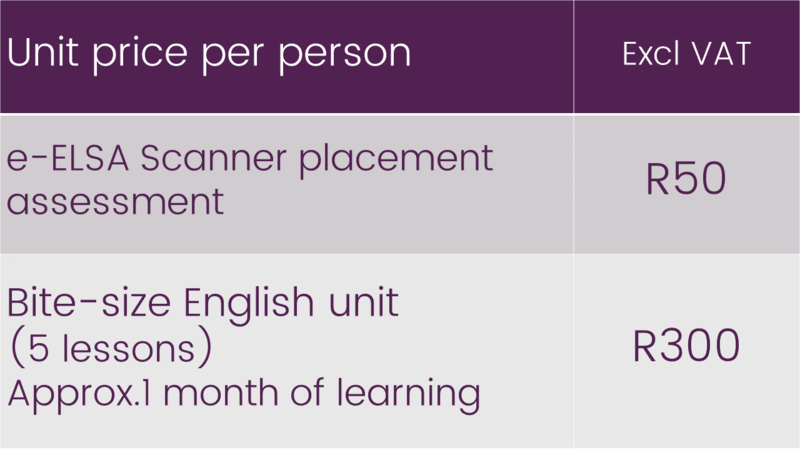 Bite-size English covers learning outcomes across four levels, each needing about 40 hours of dedicated learning for the average learner. We recommend one lesson be completed per week in approximately 180 minutes, breaking down daily learning to 30-40 minutes. 03. How long to expect a difference in language skill? 04. What if a learner is not at the ideal level for entry to Bite-size yet? Our Hands-on English (contact training) addresses Survival skills levels and will prepare learners to enter the self-directed Bite-size English programme. 05. How do we involve a Coach? 06. Why do we add the Coach function? The LMS (learning management system) provides for a remote coach to be assigned to a learner or group of learners. Progress is tracked and coaches will communicate with learners in every lesson about two or more activities by e-mail or system messenger. Coaches are prompted to comment on completion of quizzes and comprehension activities, and to score writing activities by pre-designed rubrics. Spelling and grammar mistakes are corrected using inline comments for learners to be made aware of without being penalised. ​We love the Growth Mind-set approach where learners are praised for the process and not for the performance. In learning a language, one can never afford to relax (if you don’t use it, you lose it! ), and this is the most important transition for our learners to make. And we just don’t see why our learners should battle on their own – whilst there are willing and able cheerleaders available! 07. How do we determine the placement level? 08. Why is the placement/entry level important? 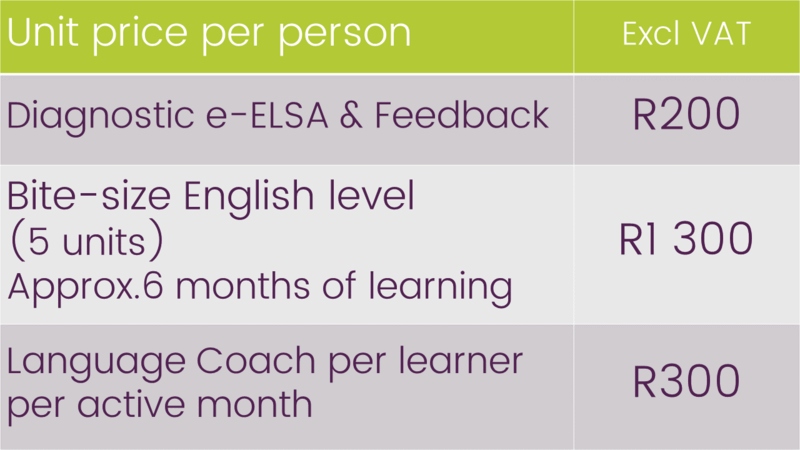 ELSA (English Literacy Skills Assessment) is our standardised placement instrument. 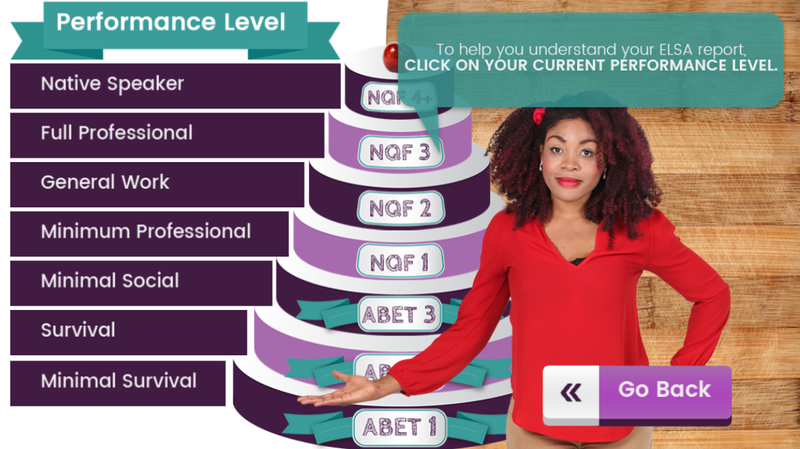 We believe that learners should have insight into their current skills evaluation to determine their own development plan and have a pre-Bite-size module available to guide understanding. ​The Bite-size English curriculum is graded and modular with language learning gradually developing from basic social skills to more advanced levels required in work and studies. Increased application of previously shared principles requires the learner to have the appropriate under-build to optimise on learning at the particular level. Ignoring placement strategy compromises learning efficiency. 01. Why did we develop Bite-size English? 02. What makes it effective? We are pretty good at diagnosing English skills and providing unique solutions. We have learnt from 127 005 ELSAs in the last 9 years that the average South African is comfortable at outcomes of a grade 7 mother tongue user – this is 2 levels away from Functional Literacy, and much too far from Academic literacy! In a changing world, the trick is to identify what to change without compromising foundational principles. It definitely applies to education and learning. Technology has brought (often) frightening opportunities – how to harness and manage it requires innovation, common sense and lots of bravery. We have used what we received to manage and re-imagined an offer to develop and recover English skills for every individual who wants to take ownership of their own development – in their own time – in their current location. It takes a scaffolding approach, using a variety of instructional techniques to move students progressively toward greater independence in the learning process. A scientifically graded, modular, holistic, vocabulary enrichment language training curriculum developed on the Learning Experience Approach. Contextualised skills programme for adult language transferees, theme-based and real-life issues. Formative assessment is objective & electronically tracked. The purpose is to enable communicative competence, which is why we don’t compromise on spelling and correct use of grammar. Interactive learning activities aligned to outcome-based principles. Remote Coach supported as an ongoing moulding process, not once-off scoring exam-style progression. 03. What Bite-size English is not? It is not a language school to teach sets of rules. It is not a curriculum to learn by heart and write an exam to demonstrate what is known about the language. It is not a teacher-directed methodology, but co-operative learning where the learner takes charge of own learning. 04. How did we build it? We used the original Hands-on English curriculum developed and successfully facilitated by Hough & Horne for many years and converted it from classroom environment to tech-based learning. In using technology to scale, we wish to put the opportunity to become Functionally literate in every South African’s hand. And we can work pretty hard! Step 1: Entry-level assessment – ELSA@home. Step 2: Enrolment to Bite-size English Unit 1 (5 lessons) at appropriate level. Step 4: Progress assessment after 6 months. Step 5: Escalate to next level. Unlimited access to unit of learning for 12 months. Remote feedback in selected writing activities. Same process as for Individual enrollment. Includes a Language Coach as Project Manager and learner support. Bulk order (> 500) discount offered. Assistance to learners in compiling of individual language development plans. Monthly report on learner progress to sponsor. Electronic learner support includes weekly e-mail with personalised comment on progress, possible difficulties and remedial suggestions. Social proficient users. With their foundational skills intact, Bite-size English will develop their skills to that of Minimum professional and General work proficiency.